BAY AREA COWBOYS AND COWGIRLS.COM your new Pai-Pa Boy - The Cowboys "Design and Construction Tips"
Commercial and Residential Building and Small Project Design. 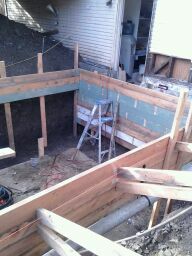 General Building and Design from the ground up, Remodeling, Retaining walls, French Drains, Foundations, Landscaping. Landscape is earth and plants and Hardscape is concrete or stone or wood members.﻿ Both can include water. i.e., ponds and natural and artificial marshes, creeks and rivers. To all homeowners. Be specific about the types of fence you build or have constructeed. A typical setback is maximum 6ft. high from grade or sidewalk with a minimal 60% visual from the front yard, visual twenty feet from front corner of lot on either side of corner. In this case the 6ft. fence was built on top of a 14" footing which made the total height 7 ft. and an inspector wrote a correction notice. I was called out to fix this for the new owners who had no idea that there was a citation (Building Code Violation). Always check with the city building division before escrow to assure no violations and check with the county recorders office to assure no liens. The solution was to design a fence with 60% visual or cut one foot off the bottom of the fence. This was a low budget makeover I did here. Even the front door came off it's hinges and was wet sanded, dried and 3 coats of oil were applied. Notice the new posts. The base of the boxes surrounding the posts were so rotten that I didn't bother to take the picture. They were partially reframed and stucco'd. The tops of the boxes where the posts enter were waterproofed by melting some rolled roofing and applying it to the posts right onto the plywood top and to the 1" metal stucco flashing. That's how water gets into most of these older wooden boxes. Right where the posts come out of the boxes.The hand rails were rusted through at the base, so I used a grinder to access some real clean steel and welded new feet on, along with new tabs to anchor to the house and new porch steps. Notice the steel beams on top of the stacked lumber ( Cribbing ) to support the existing structure. Great! Now look at the front of the structure. This owner guy argued with me that the front was stable. I shut the job down for a minute so that at least we could get the cribbing in the rear done. Very dangerous folks. Don't try this at home. This is the front of structure. Notice the dryrot and decay at the existing ends of the wall studs. 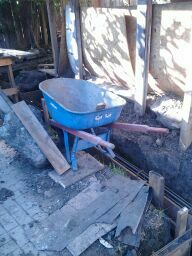 There is a small pony wall underneath that is sitting on top of a retaining wall foundation. However, the floor joist are only 2"x6" and the floor/subfloor is drrotted. Notice the floor joists. What's wrong with this cribbing? Basic terminology of pnuematic and hand tools and their uses. How to measure properly with tools, i.e. ( Tape Measurer, ruler, scales). The difference between Landscape and Hardscape. Basic terminolgy of pnuematic and hand tools and farm equipment. I got tired of coming home to this ugly fire place. Even the window trim was replaced. Outlets on top and lights were installed inside the Mantle frame and of course my favorite, refaced with slate tile by me for a more conventional look. You gotta love this color combo I did on this wall unit. The owner of this house was elated. ﻿This condition is often times called "Undermining" or my foundation has been undermined. Do you see the gap between the concrete slab and the earth? This condition is quite often associated with whats called "Hillside Creep". Earth movement on hillsides.The gap or soil that is missing has been eroded. That is, the constant flow of water has eroded the soil underneath the concrete. A French drain, is a trench covered/layered with gravel or rock that redirects surface and groundwater away from an area. A French drain can have perforated hollow pipes along the bottom to quickly vent water that seeps down through the upper gravel or rock. French drains are common drainage systems, primarily used to prevent ground and surface water from penetrating or damaging building foundations of foundation problems is water. Wet soil beneath a foundation can swell or lose strength. Surface drainage and that's only the first reason to keep the foundation dry. It is very difficult to keep all water away from foundation walls—both surface water and ground water can lead to problems. It is very important not to use partial measures in draining water that ends up at the base of the foundation wall. It is also important to know whether to use drain rock or base rock. If you have a foundation wall that is at grade or below grade, do not continue with a french drain until plans have been drawn up for a basic "over the counter" Zoning permit for a new foundation or 6" cap on the existing foundation wall. Typically a trench will be dug approximately one foot by 1 foot and backfilled with base rock not drain rock, to divert the water across the top surface. The gutters and downspouts will be tied into non-perf pipe and carried away from foundation walls. 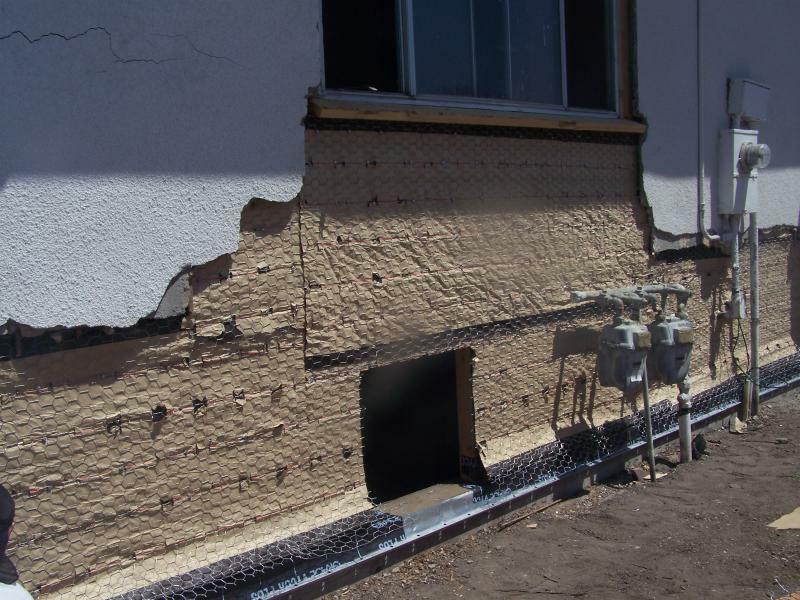 This temporary procedure will get you through until you either grade the existing yard or install a cap with a bythuthane membrane on the sidewall of the affected area. The reason for base rock versus drain rock is the potential for water to end up at the footing which will cause sinking of the the structure in most cases. Drain rock allows water to seep through to the bottom whereas base rock, unless saturated, will hold the water longer and airates(drys out) twice as fast as well as diverts surface water over the top faster due to its higher compaction rate than drain rock. Ground surface treatment adjacent to the building to direct surface water away. It is also important to know whether to use drain rock or base rock. This is a typical chimney that has been affected by a bad or faulty foundation. Most hillside and flatland chimneys have a clean out at the bottom which never gets cleaned. The soot and ash inside the chimney holds moisture and can exacerbate mold and dryrot as well as aide in foundation cracking and internal water damage . When wrapping the wire it is crusual that you have a solid plywood base and of course solid wall studs behind it. Oer the plywood is two layers of black felt paper, The first layer is felt paper and the second layer is felt paper with the wire screen to hold the stucco. On any base that has a protruding foundation footing a bithumise coating or Bithyuthane membrane (water proof membrane) is installed before the felt paper. See the black with the writing. Also at the bottom is a piece of metal called a weep screed. 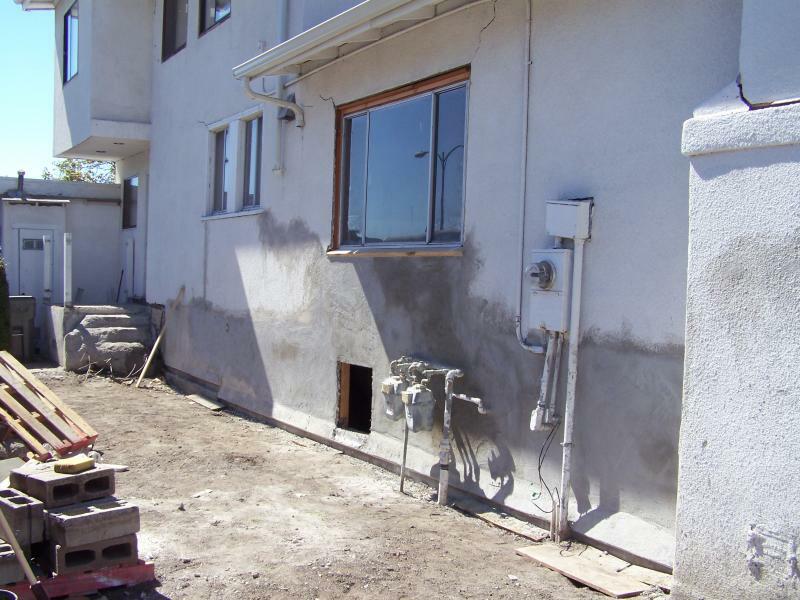 A weep screed allows water or moisture to flow out of the bottom because it has holes in it, which defers condensation from forming inside the stucco coating. With the stucco dried and cured it looks pretty good here, including the repair of the moldng under the window. 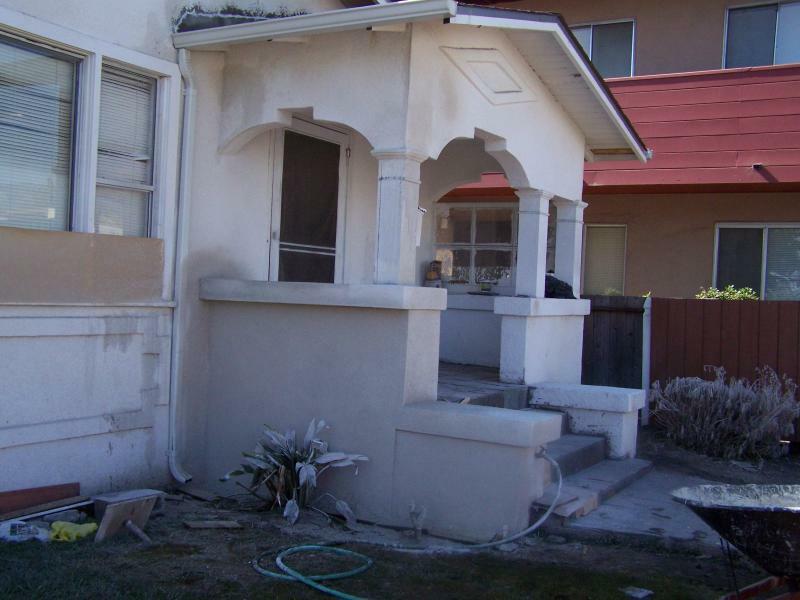 A typical porch may surprise you from the water damage (dry rot) that is there. Remove all affected areas and reframe onto new foundation. Folks use a proper respirator when spraying Termite spray. As you can see this dry rot had spread all the way to the top. Including the column that holds up the roof section. Had to go. Homeowners and contractors need to be careful what or how they distinguish #1termite termite damage from dry rot to water damage. In the insurance world, especially now in these trying days and times, Language is everything. Water damage can be misconstrued in so many ways especially if the langauge that follows isn't correct. Choose your words carefully and describe all or how the water got there. A clue( if you havn't noticed it until now it's probably, but not likely which of these three that I listed above. The water damage, The dry rot or the Termite damage? Of course this wall included a new foundation and cripple studs on this side of the house. Coming soon: All about drilling piers and shoring dirt walls for retaining walls and foundations.